While most of the Kardashians returned home, following Kim Kardashian and Kanye West's luxurious wedding in Florence, Italy over the weekend, Kourtney Kardashian and Scott Disick decided to spend more time in Paris with son Mason and daughter Penelope. Kourtney and Scott, who celebrated his 31st birthday May 26, chose to stay put. The family of four left the Four Seasons George V hotel at around 1 p.m., local time, on May 27 to do some shopping and sight-seeing. According to E! News, they made stops at Ralph Lauren and Sonia Rykiel in the Saint-Germain-des-Prés area of Paris' 6th arrondissement and then walked through the Jardin du Luxembourg. They also stopped at Yves Saint Laurent's flagship store on Avenue Montaigne, before heading back to their hotel. 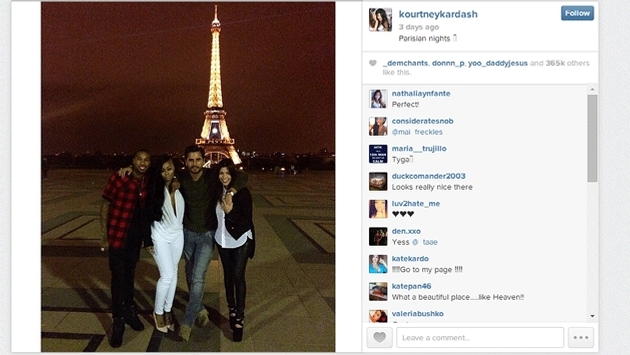 Also while in Paris, Kourtney and Scott had a date night at the Eiffel Tower and on May 26, Kourtney visited Notre-Dame, noting on Instagram, "No photograph could express the beauty. It took 180 years to build!" Can you blame them for staying in Paris for a longer period of time?